New York, NY, February 14th, 2014: NASA Atlantic Rally Cup Champions Erika Detota and Mary Warren will team up for their second season. The female duo dominated in the final classification of 2013 Atlantic Rally Cup doubling the points of her closest 2WD rival and winning the overall highest points of the cup. The team is proud to announce their third straight year with Ruge’s Subaru of Rhinebeck, NY as main sponsor. “It was a stellar year for Erika and Mary and we are excited to have them on board for another season. This relationship is so much more than racing and we are happy to say there is exciting events coming up for us in 2014.” said director of marketing at Ruge's Automotive - Patrick Downes. 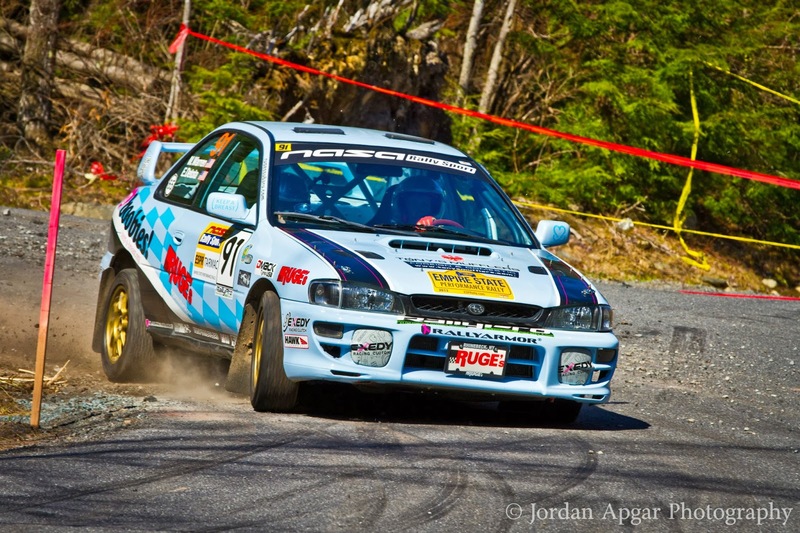 The Ruge’s Subaru Impreza 2.5, will be run again by Flat Out Automotive from Elizabethville, PA, with Dan Woland as crew chief for another year. Flat Out Automotive will also become a wheel supplier for the team and Erika and Mary will run new EvoCorse wheels in their 2014 efforts to help promote their new distribution through Flat Out. “I have the best supporters I could ask for! Together our team and sponsors make it possible to have a competitive car and make it to events. We are working with FlatOut Promotions to help us film and review our sponsors’ products installed on the car which has been a fun project” comments Erika. Her team is supported for 2014 season by: Tony’s Mufflers, Exedy Racing Clutch, HMS Motorsport, DBA USA and Whiteline. Detota and Warren will begin their season at ESPR on the asphalt roads near Rock Hill, NY. “We both like this event and Erika knows it well. We are going to have fun and try to write our own notes at the rally.” said Mary Warren. A highlight in their season this year will be a debut in the Subaru Mount Washington hillclimb also known as the Climb to the Clouds. The event will be run as part of Rally America National Championship series on June 27 - 29 and will be televised on NBC Sports Network. The event is invitational only and Detota and Warren will be one of only 20 teams participating. “Everyone at my team is really proud to be part of this race. Its great to have Subaru supporting not only my team, but the whole event.” says Erika Detota. “It will be completely new experience for the entire team.” . Team’s season opener on April 26 - 27 at Empire State Performance Rally based in Rock Hill, NY is the second round of the NASA Atlantic Rally Cup and the NASA National Championship Qualifier. Erika Detota is supported by Ruge’s Subaru of Rhinebeck, NY, Keep a Breast Foundation, Tony’s Mufflers, Exedy Racing Clutch, HMS Motorsport, DBA USA and Whiteline.